She has since channelled her passion for fashion by founding multi-label boutique and e-retailer SocietyA in 2014, which she oversees with her close friend Lily Hamid. “The A in SocietyA stands for Asia—the continent has so much to offer in terms of culture and design, and it’s mind-blowing to have these creative possibilities brought to life through fashion,” shares Lay Peng. Her inimitable sense of style extends to her bathroom too, which has been personalised to suit her dressing and grooming needs. Lighting matters, particularly for the fashionista, to see her full look in the best light possible. “I really appreciate lighting in the bathroom, whether it’s natural lighting or back-lit lighting from the mirrors,” she adds. “I like my bathroom to be modern and sleek, and paired with textures such as travertine and marble"
And having a rainshower in her bathroom is definitely a must; this shower system produces an adjustable water flow to create an indulgent shower experience. The go-getter knows that every bit of personal time counts: on top of her work for SocietyA, she also serves as an executive director at Shingda Construction (founded by her father Pek Ah Leck), while being a mum to two young children. “After a long day of work, I just want to relax and enjoy my personal time in the bathroom,” she quips. Follow a day in the lives of three inspiring individuals through this special series by GROHE and Singapore Tatler Homes. 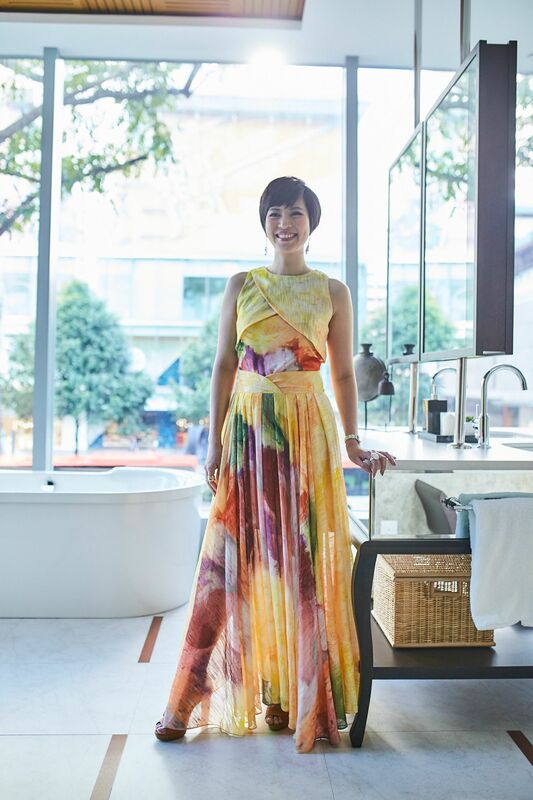 Here, Pek Lay Peng of multi-label boutique SocietyA offers her take on the elements that make up a dream bathroom.